SALT LAKE CITY (AP) There’s no longer any surprise in the Jazz locker room when Donovan Mitchell takes over a game. Teammates have begun to expect it from the rookie, whose latest feat was to outduel LeBron James on the four-time MVP’s 33rd birthday. 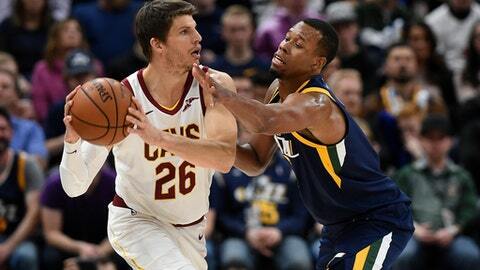 Mitchell scored 29 points, and Utah handed James and the Cleveland Cavaliers their third straight defeat, 104-101 on Saturday night. ”Just have no conscience when it comes to certain things,” Mitchell said. ”I missed a few shots that I normally make and just moving on to the next shot, making the right play at the right time. Just treating the last two minutes the same as the first two. James had 29 points, eight rebounds and six assists as his personal losing streak at Utah extended to seven games, four of them with Cleveland. The Cavs’ three-game losing streak is their second this season. Mitchell blew by J.R. Smith and made a layup in traffic over James with 35 seconds remaining to give the Jazz a 100-97 lead. James then missed a layup, and Utah finished off the game from the free-throw line. The Jazz snapped a three-game losing streak. ”We turned the basketball over, we couldn’t make shots,” Cavs coach Tyronn Lue said. ”I just thought defensively we weren’t very good. Second unit gave us a great boost and got us back in the game, moving the basketball, getting stops defensively. James powered the Cavaliers’ late rally, but the Jazz were able to hold on. The Cavs led by 10 at the end of the first quarter. Utah chipped away in the second and trailed 53-48 at halftime. Cavaliers: Lue said Isaiah Thomas (hip), who has not played this season, looked good during a Friday scrimmage and felt good Saturday. Doctors have not yet cleared Thomas to play, Lue said. Jazz: C Rudy Gobert was re-evaluated Saturday and will miss at least two more weeks with a sprained PCL. The Jazz had lost 10 of 12 while playing a brutal schedule that included 11 games against teams in position to make the playoffs. Snyder acknowledged there’s been a psychological toll, but said the team is resilient. ”We try to make it about more than winning and losing,” Snyder said. ”I think a focus on the process or improving and those things. James was in a storytelling mood at the pregame shoot-around when asked about his favorite birthdays. He enjoyed turning 18 but said there was ”this false notion that you’re a grown man.” Even James couldn’t do whatever he wanted. Fake identification wasn’t an option, considering he was on the cover of Sports Illustrated before he was 18. Cavaliers: Host the Portland Trail Blazers on Tuesday. Jazz: Host the New Orleans Pelicans on Wednesday.